I’m going to start by saying that I never like a Magnetic Fields record through and through when it’s first released. Actually I never like a Magnetic Fields record through and through. Their music seems to be cyclical in nature to me. I’ll listen to a record of theirs and love certain tracks, be indifferent to others, and hate others. Then a few months later, I love different ones, be indifferent to others, and hate others. This can be traced back to their first song I heard, “The Desperate Things You Made Me Do.” I hated it. Really really hated it. Now I love it, unashamedly love it. 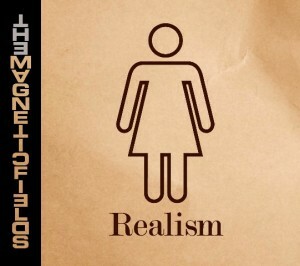 So I’ve listened to Realism, and I find there’s nothing that hugely stands out to me. There’s fun stuff, but none of it really feels like a Magnetic Fields record. There’s songs which feel like they could be from one of the musicals Stephin Merritt has scored, there are others which sound like they could be Gothic Archies songs. There’s definitely some fun tracks on the record, “We Are Having A Hootenanny,” “Everything Is One Big Christmas Tree” & “The Dada Polka” are among my favourites. We’ll see how it holds up to a few hundred listens. I wasn’t a huge fan of i (I still can’t stand “I Was Born”) and now it’s among my favourite of Merritt’s work. I also at first really loved much of Distortion, and now I’m indifferent to much of it (though “The Nun’s Litany” is still brilliant). Are you tired of reading about my thoughts of the Magnetic Fields? Well, screw you, I’m going to see them tomorrow!